Looking for a challenge? Come join us on the Great Barrow Challenge. The event will start and finish each day at The Academy Health & Fitness Centre in Barrow. Each day will be a different route which will consist of both road and off-road terrain, while taking in the beautiful Suffolk countryside. A specially designed medal is awarded for those who complete the full four day challenge. The event is based around raising funds for Help for Heroes. An organization that raises money for wounded service men and women. To raise money for our suggested charity Help for Heroes. To raise money for any charity or legal cause of your choice. Take part for a personal challenge, fitness or simply for the enjoyment or being part of something special. 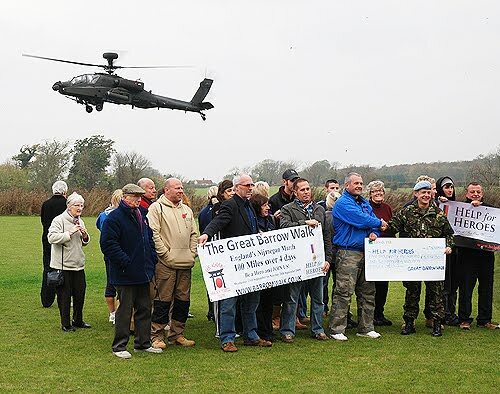 The Great Barrow Challenge is for both civilian and military individuals and teams. So come and join us to see a view of England you can't replicate and challenge yourself.